The Secret Garden may be one of the most famous gardens in literature. This beloved children’s classic follows the life of Mary Lennox, a sickly, newly orphaned girl who leaves her life of privilege in India to live on the Yorkshire Moors. 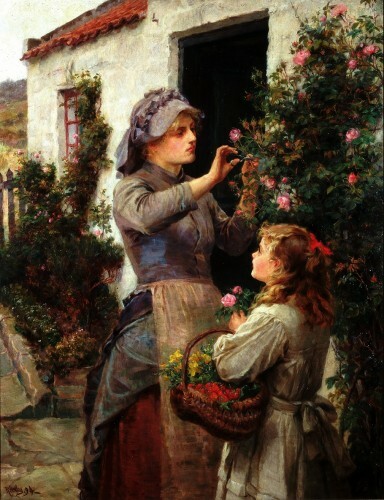 A good natured servant tells Mary of a secret garden in which roses used to grow. One day she finds the key to the secret garden buried in the ground and uncovers the hidden door. Mary’s curiosity is piqued and her character begins to unfold. We are a nation of gardeners: creating outdoor rooms in the smallest spaces, growing our own food and making play-spaces for our children. Many of us find pleasure and pride in growing things and our outdoor spaces bring beauty into our everyday lives. The current explosion of interest in allotments reflects a need for city dwellers to have a patch of ground to call their own. By the late 1800s, having a garden was a mark of status. A national nostalgia was reflected by artists and designers who thrived on an audience idealising the rural past. Helen Allingham, Kate Greenaway, Beatrix Potter and Frances Hodgson Burnett were all in vogue, with Allingham’s influence still felt as Stanley Spencer began painting the gardens of the Cookham during the 1920s. In this summer scene, a young woman is cutting roses to brighten up the room of an ill person. The roses grow around the door of her whitewashed cottage. Her blue-grey cap is a type worn in the fishing village of Staithes in Yorkshire. She is shown in ordinary working clothes, with her skirt pinned up under her apron to keep it clean. A little girl with a red ribbon in her hair holds a basket full of the flowers. Newcastle artist Ralph Hedley was one of many painters who visited Staithes. This picture illustrates his growing interest in painting natural light effects in the 1890s. Hedley painted traditional scenes of the North East reflecting somewhat idealised 19th century life, right through into the early 20th century. 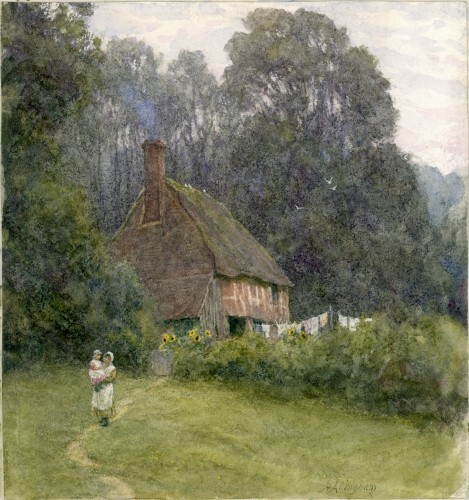 Helen Allingham was a prolific artist, best known for painting English cottages and country gardens. Working in an eighteenth-century pictorial tradition, she deliberately sought out picturesque subjects which she ‘improved’ by emphasizing their dilapidated charm – worn thatch, moss-covered roofs, broken fences, overgrown gardens. These cottage scenes, with the women engaged in domestic pursuits – childcare, laundry, feeding poultry – signified social order, a place where the established proprieties of class and gender were still observed. Beatrix Potter is one of the world’s best-loved children’s authors and illustrators. 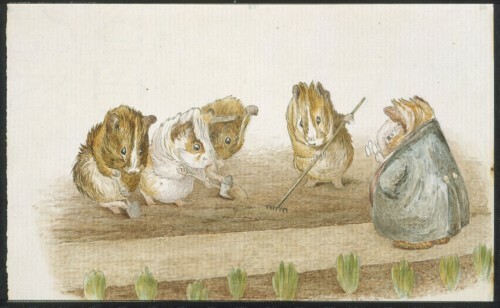 She wrote the majority of the twenty-three original Peter Rabbit books between 1901 and 1913. This composition was later redrawn for Cecily Parley’s Nursery Rhymes to accompany Potter’s verses.